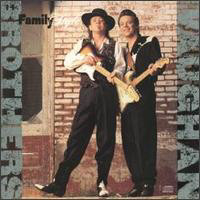 Family Style is a blues-rock album by the Vaughan Brothers, released September 1990. The album features the brethren guitarists and vocalists, Jimmie and Stevie Ray Vaughan, in their only studio collaboration. In his early years, Stevie Ray Vaughan often remarked that he would like to do an album with his brother. He fulfilled that wish in his very last studio performance. The liner notes end with "Thanks Mama V. for letting us play."